Master of Public Health (MPH) student Megan Steeves spent 12 weeks in a summer practicum placement gaining hands-on work experience in public health. Steeves is a recipient of the Canadian Institute of Health Research (CIHR) funded Dr. James Rossiter MPH Practicum Award. “Can you tell me the reason why you are visiting the emergency room today?” I asked the young man as I watched him sink back into his bed, deflating more and more with each passing moment. I glanced up from my questionnaire keeping my smiling, cheerful demeanor, and I was met with piercing blue eyes before the words he uttered made my stomach drop. I scribbled down his response in the marked box, hesitating as I prepared to leave the curtained hospital room. As I rounded the curtain, I saw the wagging tail of Murphy, the therapy dog, whose presence had so positively transformed the young man only moments before. I smiled, ready to witness Murphy transform the next patient like only he could. Over the course of the summer, I was fortunate to undertake a practicum placement at the University of Saskatchewan, in the Office of the Research Chair in Substance Abuse. Led by Dr. Colleen Dell, in collaboration with Dr. Darlene Chalmers, assistant professor in the University of Regina Faculty of Social Work, the unit investigates the role of Animal Assisted Interventions (AAIs), including therapy dogs, in providing therapeutic benefits to a diverse group of populations such as Indigenous communities, incarcerated people, and substance users. During my time working with Dr. Dell and Dr. Chalmers, I gained a wealth of public health work and research experience. I collected primary data for a research project in the emergency department at Saskatoon’s Royal University Hospital, and assisted with therapy dog visits in addiction treatment centres in the broader Saskatoon community. I drafted an academic article for publication about a study with Veterans Affairs Canada, contributed to the development of communication aids for three unique research projects, and attended organizational meetings with an interdisciplinary, professional team called Break the Barrier, who work with individuals struggling with mental health and addictions issues. From these incredible experiences, I feel I developed a greater depth of knowledge and exposure to the Indigenous worldview. Many of the populations my practicum site work with include Indigenous people, which unmistakably shapes the way issues are addressed. Indigenous traditions are integrated into research practices and meeting itineraries, and this facilitated open communication and a collaborative work environment. I greatly appreciated the time I spent speaking with an Elder as we awaited our flight back to Saskatoon following the Canadian Research Initiative in Substance Misuse (CRISM) Prairie Node Meeting in Calgary. I will always remember sitting beside a former gang member, laughing as he playfully chastised me for not liking the rain, before he carefully explained its significance to him as an Indigenous person. These opportunities to connect were truly unique experiences of my practicum, and allowed me to work side-by-side with and learn from members of Indigenous communities that continue to face many challenges in public health. Being a recipient of the Dr. James Rossiter MPH Practicum Award allowed me to fully immerse myself in my practicum experience. I was able to participate in community therapy dog visits, and travel out-of-province. These opportunities contributed greatly to my knowledge and understanding of public health outside the classroom. I feel that without this award, I would not have had the opportunity to explore public health research and gain insight into how I would like to move forward within the field. 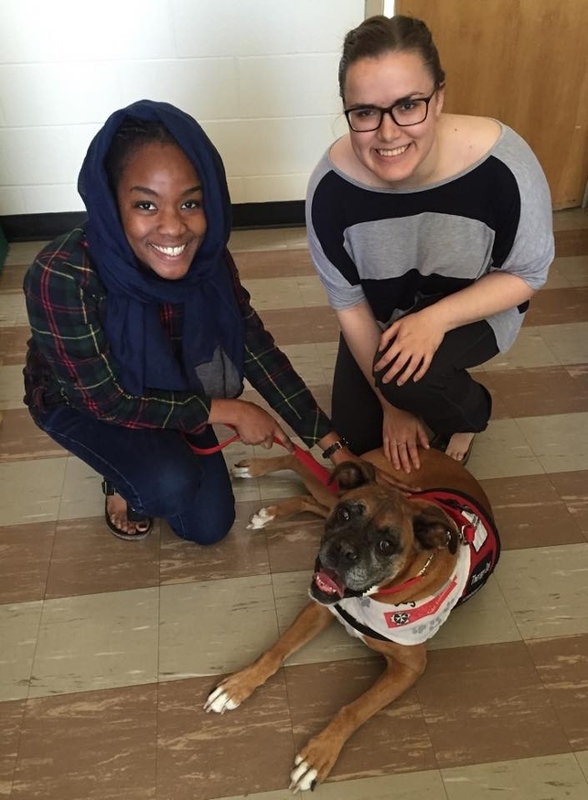 Overall, I am very grateful for my ‘pawsitive’ practicum experience! By Megan Steeves, MPH candidate.